At Fruitilicious Creations & Cakes we specialize in artistic and modern approaches to designing Luxury Custom Cakes and Desserts, Fruit Arrangements, sweet indulgence Dessert Table and Candy Buffet services including Personalized Party Favours. We also cater for Corporate Events and Gifts. For your convenience, we are located in Mississauga, in the greater Toronto Area. We provide complementary cake tasting and design consultation by appointment only. Much more than a dessert, your cake is the centerpiece of your celebration. We design our cakes with meticulous attention to details with you in mind. 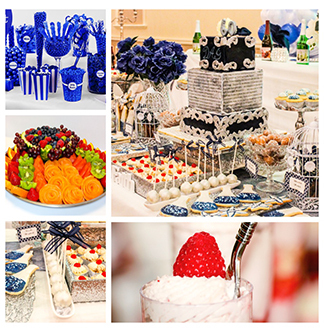 Our goal is to provide you with unlimited design options, from classic to contemporary to make your cake, dessert table and or candy buffet the showpiece of your event. Visit our website and have fun browsing though our portfolios.